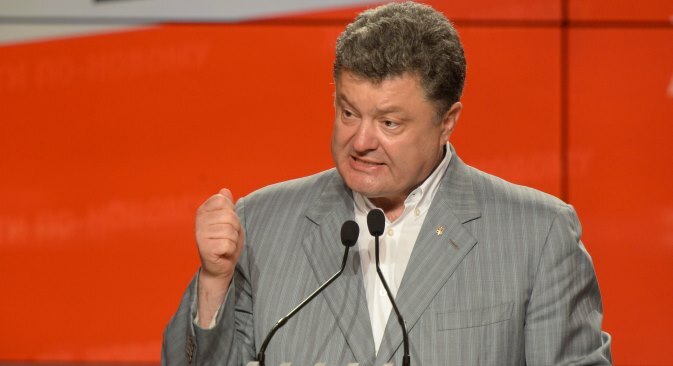 A correspondent from the newspaper Kommersant got the opportunity to speak one-on-one with Petro Poroshenko. The conversation was muddled, but it was the first interview with the newly elected president of Ukraine. Of course, they shouldn’t be forced. But residents of the Donbass should also be allowed to speak Russian, and this right should be legally formalized so that they won’t be afraid someone will just take it away. “A resident of the Donbass, for example, thinks that the problem is that he doesn’t have an official language that he can use in full measure for everything in his life. Not only in ordinary life — because today you can speak in any language at home or at work or wherever else and there is no problem, as you know as well as anyone. When you are speaking to a local government body, in court, or any other place in Russian, there also is no problem. But the right to defend this right… a person could possibly want to demand that. “Where did you see that? What forceful seizure? Who seized what? Tell me. On December 1, as you surely know, since it was broadcast on every television network in the world, I stood up for the police and prevented any forceful seizure of any administrative building. “My principal position, which I’ve maintained throughout the whole conflict, is that I am fundamentally opposed to the seizure of any buildings. Today it is clear that the vast majority of Ukrainian citizens supported my position. So, excuse me, but the position that some people try to use to justify their actions, the position that there is no legitimate government in Ukraine, is cheating. “Look, how interesting. We must pay our debt, you say, but the seizure just needs to be discussed. We need to discuss everything.